I have to say I didn’t have a single problem with this. It knitted up quickly and didn’t find it boring in the least. I made a skinnier version with 54 stitches and also went a bit longer doing 14 repeats on Section 3. 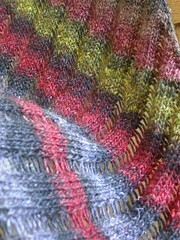 Here’s a close-up of the dropped stitches. Don’t they look yummy! 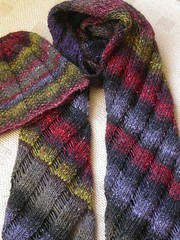 This is lovely wool to work with, despite all the ‘bits’ that come out of it while your knitting. OK, now it’s back to socks and maybe some baking………. Sock exchange socks are here!